We can't take Bailey out to walk yet as he hasn't had his final vaccination, so sometimes we take him to the rooftop for a run around. 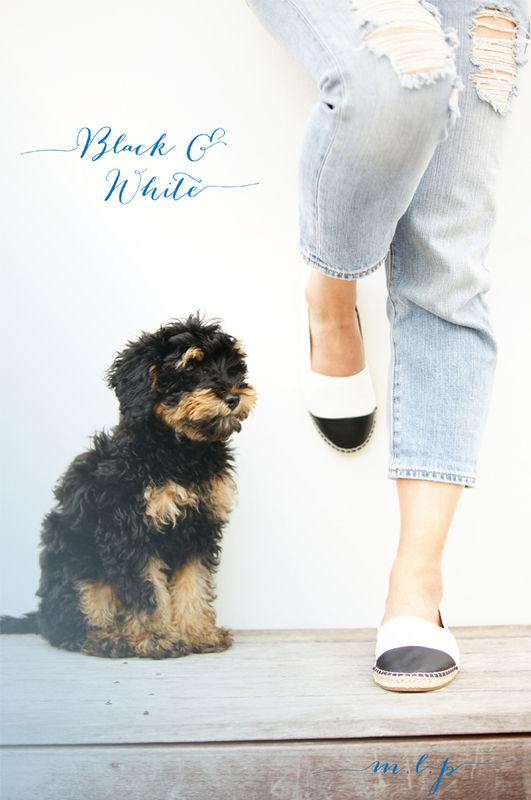 Dog walking attire should be whatever makes you comfortable, and these black and white espadrilles from Seed Heritage (constantly sold out online, but I believe are available in store here in Australia) are the comfiest flats I've worn on first wear, for the longest time. I'm a total espadrille convert! This Double black striped tee is so comfy and I love the sporty feel, making for a great 'on trend' active attire. It's a great top, should you start the day off thinking it was a bit cold...but then later finding the day getting warmer as the day goes on. The black stripes are actually mesh, so it's totally perfect for letting a bit of breeze through. Anyways, I can't wait to take this little one out, he is itching for it I know, always wriggling around in my arms when I take him to the local shops! Until then, he currently bounds around our apartment playing fetch, bolts around on the rooftop and also plays with his other furry friends whenever he gets a chance.